I'm so excited - today I have a great giveaway perfect for boy moms! 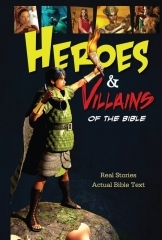 Thanks to Tommy Nelson, we had the chance to review Heroes and Villains of the Bible. Any book that gets my boys excited about reading God's Word is a winner for me, and my boys love this book! Each story contains Bible text (from the International Children's Bible), followed by a short life application section. My nine year old loved reading the Bible text on his own. We both loved the amazing artwork, too. I love the fact that Heroes and Villains of the Bible makes the Bible so readable for kids. It breaks Scriptures down into short chapters, so its definitely less intimidating than picking up the entire Bible. I also love the fact that its sent my nine year old to his Bible more - he finds someone he wants to learn more about and he goes to his Bible to dig deeper. This book is a perfect read-alone book for 8 to 12 year olds. Its also a great read-aloud for younger kids or for family devotional time. Thanks to the great people at Tommy Nelson, you can win a copy for your family! To enter, just leave a comment here telling me which Bible hero your kids would like to read about the most. Be sure to include an email address so I can contact you if you win. For extra entries, follow Tommy Nelson on their blog, Facebook, or Twitter (one entry for each). Entries will close Friday, January 13. The winner will be chosen Saturday. You can also find out more by checking out "Heroes and Villains of the Bible" on Amazon or you can check it out here. David..Shows that none of us are beyond falling, or beyond the saving grace of God.